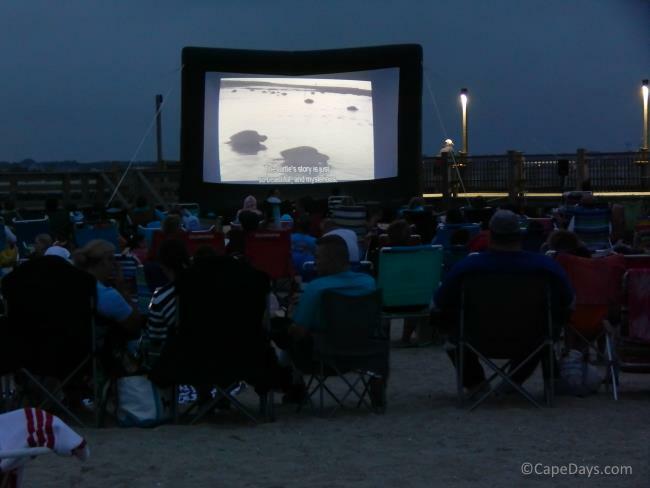 Ocean, Bay & Sound Beaches on Cape Cod: What's The Difference? Which Shoreline is the Best? Whenever I'm asked to name my favorite beaches on Cape Cod, I have to smile. After all my years here, it's still impossible to say whether I like our Ocean, Bay or Sound beaches best. Seriously ... just look at these beaches. How do you choose??? Our Atlantic Ocean shoreline has some of the most gorgeous scenery in all the world. And I'm not the only one who thinks so. Check out the Top 10 ratings in prestigious travel magazines and you'll usually find at least one of our ocean beaches very prominently featured. 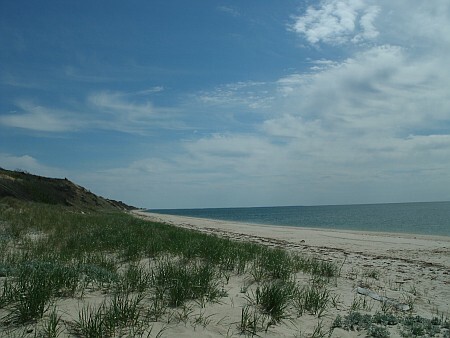 In fact, Cape Cod's famous Coast Guard Beach made it to Dr. Beach's "Top 10" list again in 2012 - ranked at #5 in the USA! 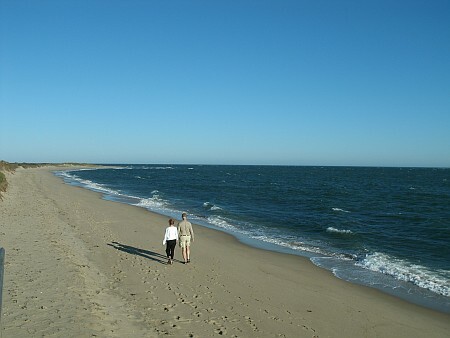 On the eastern shoreline of Cape Cod in the towns of Chatham, Orleans, Eastham, Wellfleet, Truro and Provincetown. Mainly soft, white to off-white sand. ... and a bit more moderate at others. Cold! During the summer months, water temps might reach the low 60s. You'll find a little bit warmer water in tidal pools here and there. Some Ocean beaches are wheelchair accessible. At others, there are wooden stairs from the top of a dune down to the beach. At a few, you'll have to hike through loose sand to get to and from the beach. 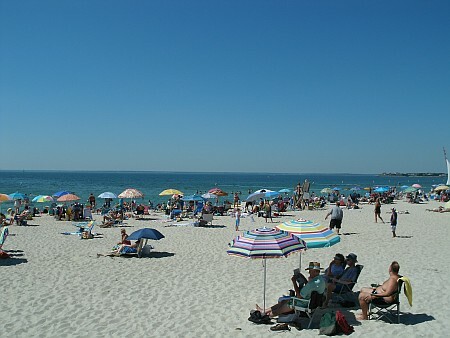 Most of the Atlantic Ocean beaches are within the Cape Cod National Seashore. 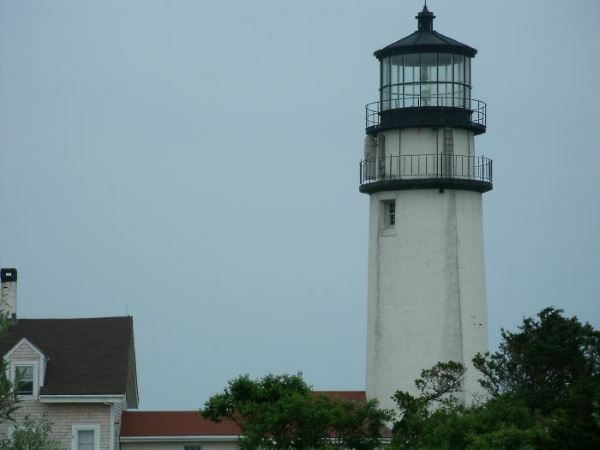 That's 40+ miles of federally protected land and coastline with lighthouses, walking and biking trails, historic sites, nature preserves, and breathtakingly beautiful scenery. Beach camping and small campfires are allowed at some of our Ocean beaches, too! 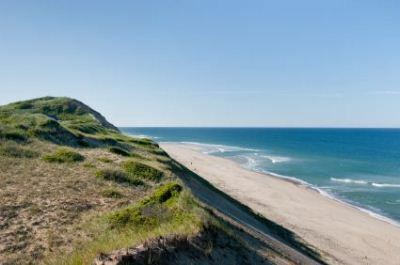 On the northern shoreline of Cape Cod in the towns of Sandwich, Barnstable, Yarmouthport, Dennis, and Brewster, and on the western shores of Orleans, Eastham, Wellfleet, Truro and Provincetown. Mainly soft to light texture, off-white sand. Pebbly tide line on a number of beaches. 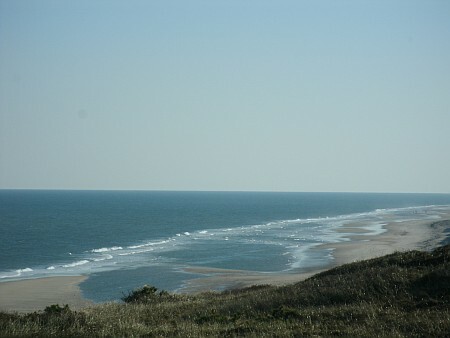 Surf is usually quite mild, good for all ages and swimming abilities. Waves do build up a bit more when there's a storm offshore. Chilly, but not anywhere near as cold as the Atlantic Ocean. Water temps reach the upper 60s to low 70s in the summer. Tidal pools and creeks hold even warmer water. There are stairs at some beaches and wooden boardwalks at others. 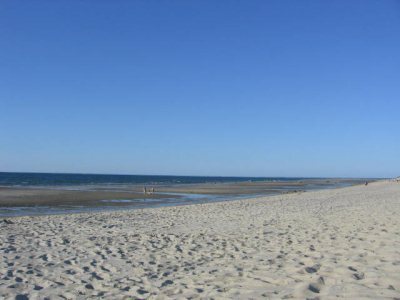 Many Cape Cod Bay beaches are easily accessible by all. Leaving miles and miles of sandflats to walk, jog, fly your kite. And hundreds of tide pools to explore for pretty shells and little sea critters, as the Bay waters recede. Low tide is also the perfect time for a game of beach bocce - a favorite pastime of Cape Cod locals and visitors alike! Ready to Roll - Beach Bocce! Tide Tip: When the tide turns and starts coming back in on the Bay-side beaches, the water level rises much more quickly than you can imagine. If you're too far out on the sandflats when the tide turns to incoming, you might be in over your head before you know it. It's a good idea to print out a daily tide chart, and keep it handy in your beach bag! 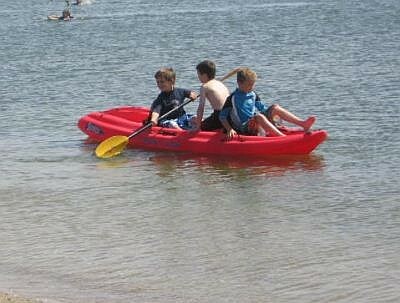 Launch your kayak or windsurfer from the shore, fly a kite with your kids, or just laze the day away on the sand. 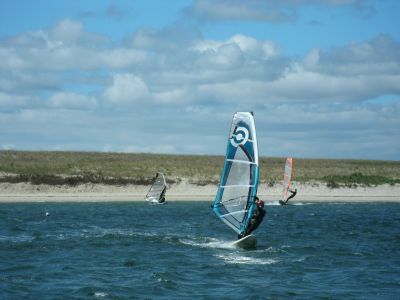 The beaches of Nantucket Sound, Vineyard Sound and Buzzards Bay are family friendly, watersports oriented, and perfect for all ages! 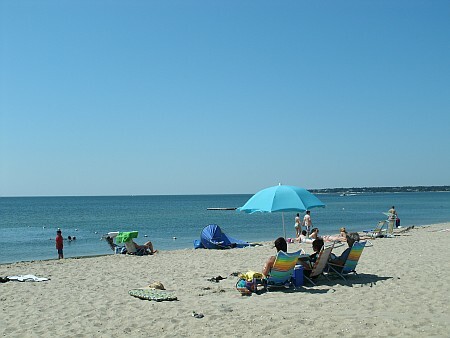 On the western and southern shoreline of Cape Cod in Falmouth, Mashpee, Hyannis, Yarmouth, Dennis, Harwich and Chatham. Hardly any waves, except when it's very windy. Even then, the surf is still relatively gentle. Some beaches are accessed by stairs, but most are quite easily accessible by all. I might be a little biased on this one. I'm a big fan of warm, calm water and hanging out on the beach with the latest Brad Thor novel. 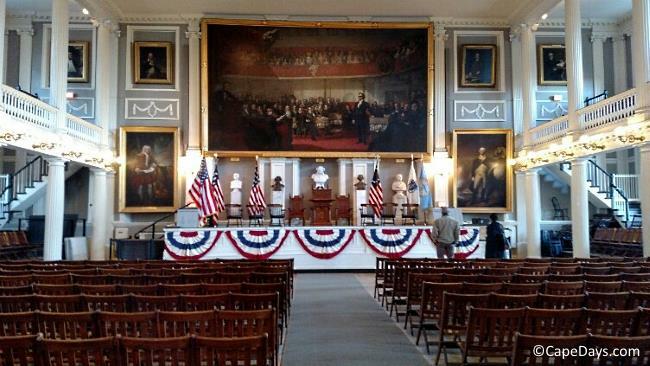 Nantucket Sound, Vineyard Sound and Buzzards Bay beaches are perfect for that. 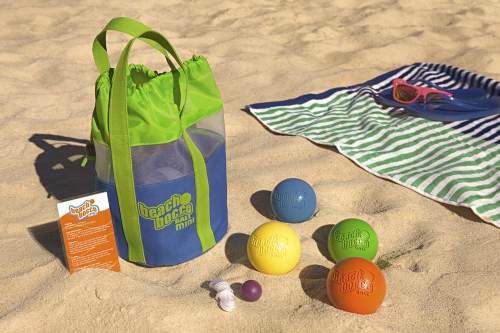 And for kids to play with their beach and water toys, without mom and dad having to worry about a big wave coming along washing them off to Spain!